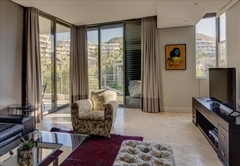 Pembroke 108 is a highly recommended property providing self catering in V&A Waterfront for up to 2 guests visiting the Atlantic Seaboard region. 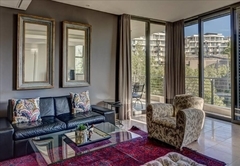 Pembroke 108 is a great self catering apartment offering fine accommodation in Cape Town in the Marina Residential Area of the V&A Waterfront with one bedroom, sleeping two guests. The Victoria & Alfred Waterfront, also known as the V&A, is a fun hub of unrivalled shopping, eating and fun. Table Mountain, Lion’s Head and Signal Hill loom over it, while the crystal clear of the Atlantic Ocean sprawls in front of it. The bedroom has two single beds that can easily be converted into a king size bed. 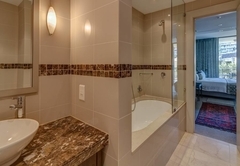 The en-suite bathroom has a bath. 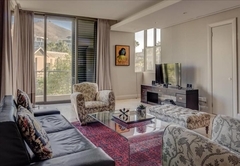 The living area contains a comfortable couch and chairs with a TV, DVD player and a DStv. There is a beautiful dining area alongside the living room where you can enjoy your home prepared meals. 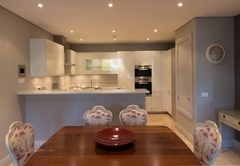 The kitchen is well equipped and contains modern appliances including everything your will require during your self catering stay. 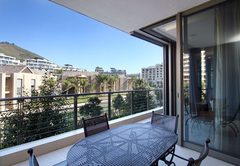 The balcony has a table and chairs and allows you the opportunity to dine al fresco whilst admiring spectacular views. The apartment has air conditioning and underfloor heating for your comfort. On site you can make use of the four communal swimming pools and the fully equipped gym. There is 24 hour security and secure parking for your vehicle. This shopping centre is full of hundreds of exciting shops and dozens of restaurants and bars, which showcase the world-class creativity and cuisine of South Africa. In addition, the Waterfront Marina is the address of a collection of opulent apartments that overlook the water. 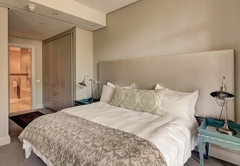 These are the ideal base from which to explore the many attractions of the Mother City, but discreet and private too. Added to the shops are the cinemas, amphitheatre and live theatre, where shows and productions are the order of the day, guaranteed to delight passers-by and audience members. 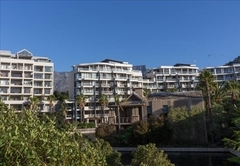 Many of Cape Towns’ top tourist attractions are within just a few minutes’ drive of the Waterfront. 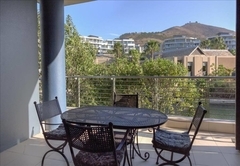 Others (such as the Winelands and the international airport) are only a little further afield. The bedroom has two single beds that can easily be converted into a king size bed. Excellent little apartment at the V&A! We were very happy here, thanks. Response timePembroke 108 typically responds to requests in 5-10 minutes.